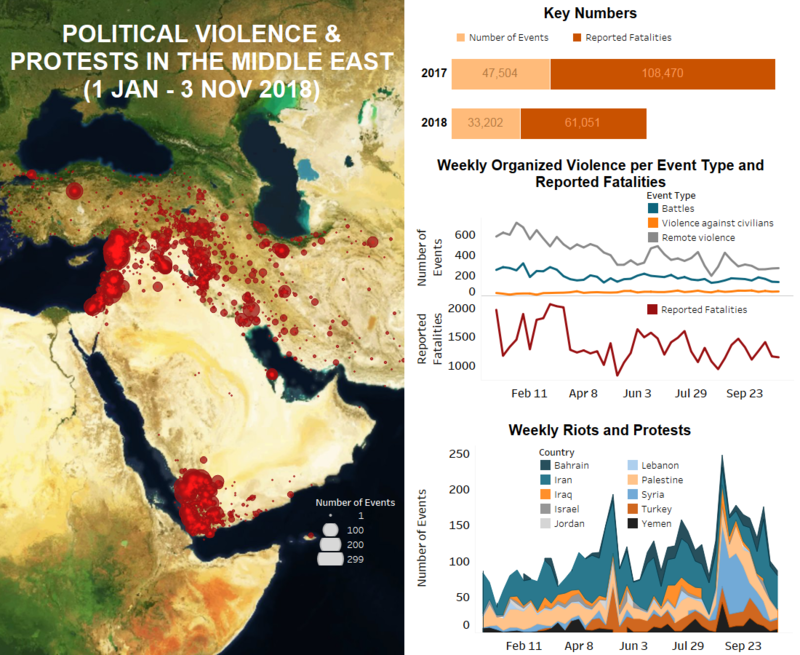 Last week in the Middle East region, overall trends in armed violence and demonstrations continued at a similar or reduced rate. In Gaza, diplomatic efforts to curb violence appear to be working, while in Iran and Bahrain demonstrations continued due to a lack of change. In Iraq, armed attacks on civilians rose as Shiite pilgrims made their way across the country, and in Turkey, military forces assaulted Kurdish rebel positions in the southeast. In Syria and Yemen, several new or renewed offensives began in different areas. Last week in Israel/Palestine, cross-border violence and Great March of Return demonstrations continued in Gaza, yet at a significant reduction. Friday border demonstrations were the quietest in months – possibly as a result of continued diplomatic efforts between Israel, Hamas, and Palestinian Islamic Jihad (PIJ). On Thursday, November 1, Hamas and PIJ jointly announced that they would try to keep the protests “popular and peaceful” (Xinhua, 2 Nov 2018). On Friday, Hamas security was reportedly preventing people from approaching the border fence east of Gaza city. The dramatic reduction in border violence indicates that Hamas may very well have the ability to stop both rioting along the border as well as the launching of makeshift incendiary devices. On Saturday, a draft of the Israel-Hamas ceasefire was released and it appears to be a significant first step towards ending the blockade and easing violence (Ynet, 3 Nov 2018). In Iraq last week, there was a rise in attacks on civilians, the majority of which are known to have been perpetrated by the Islamic State (IS). At least one of these attacks directly targeted a Shiite procession as part of the Arba’een Pilgrimage. An IED reportedly killed at least 2 pilgrims on their way to a shrine in Khanaqin district of Diyala governorate (Anadolu Agency, 30 Oct 2018). Several IED attacks linked to the group also took place in areas with typically heavy pilgrim traffic. Also last week, two mukhtars were reportedly killed in targeted attacks by IS. The killing of village leaders is not unusual for the group, but appears to be recently occurring on a more consistent basis. In Iran, dozens of peaceful protests by labour groups, students and farmers continued throughout the country. Notable were several protests which spanned the entire week by farmers in Isfahan province against water shortages caused by a years-long drought and government mismanagement. The Zayandeh Roud River, flowing down from the Zagros Mountains through the city of Isfahan and its suburbs, once watered their region. However, farmers claim that the government has deprived them of their right to water by diverting sources to steel factories and refineries, as well as to the neighbouring Yazd province. In Bahrain, protests and riotous activity occurred as groups called for the boycott of upcoming elections and the release of political prisoners. Among those political prisoners is opposition leader Sheikh Ali Salman, who was recently sentenced to life in prison on the charge of spying for Qatar despite being previously acquitted (NY Times, 4 Nov 2018). The Bahraini regime is also alleged to consistently conduct arrest raids against dissidents. According to the Local Network for Raids Monitoring, security forces allegedly raided 90 houses in 23 different areas in Bahrain, and arrested 74 people during the month of October (14F2011, 1 Nov 2018). In Oman, there was a rare protest demonstration held in Muscat against the visit of Israel’s Prime Minister and the normalization of ties between the two nations. During the demonstration, a group of Omanis burnt an Israeli flag. In Turkey, clashes between Turkish military forces and Kurdistan Workers Party (PKK) fighters continued in the southeast. Compared to the week before, it appears that Turkish military forces conducted more offensives, particularly in the provinces of Hakkari and Sirnak. In the latter, heavy PKK casualties were reported during a military offensive on Judi Mountain. Meanwhile, in Sanliurfa province, the groups clashed along the border with Syria. Inside Syria itself, Turkish military forces shelled several positions of the Syrian Democratic Forces (QSD) and People Protection Units (YPG) along the Syrian-Turkish border in Aleppo, Ar-Raqqa, and Al-Hasakeh governorates. As a result, QSD forces have temporarily suspended their ongoing offensive against IS in the Hajin enclave of Deir ez-Zor governorate. In Aleppo governorate, joint Turkish-American patrols began in Menbij district after months of negotiations and preparation. The patrols are aimed at removing Kurdish control of the area and took the form of both ground operations and Coalition overflights. Meanwhile in Idleb, there were several violations of the Sochi agreement between Turkey and Russia, which had earlier established a DMZ zone. Regime forces shelled several villages in the zone, reportedly killing civilians. In response, Islamist factions like Hurras Ad Dein, Hayat Tahrir al Sham, and the National Liberation Front began shelling regime positions in Hama and the Lattakia countryside. In Yemen, battles continued in Al Hudaydah port city, with anti-Houthi forces taking control of several new areas and pushing as far as the outer boundaries of Hudaydah University and the ‘July 7’ area. In the meantime, anti-Houthi troops began a renewed offensive in the north, attempting to take the Al Dhahir, Haydan, Marran, Malahit, and Dahyan areas of Sadah governorate. More than 10 military brigades are reportedly participating in the ongoing offensive. Across the southern governorates, protest demonstrations occurred to denounce the presence of Saudi troops in the area and also the alleged corruption within the internationally-recognized government. Finally, Coalition airstrikes increased last week, with more than 30 hitting the airbase adjacent to the Sana’a international airport, and 6 hitting a Houthi training camp in Al Marawiah district of Al Hudaydah. The latter reportedly killed over 100 fighters.